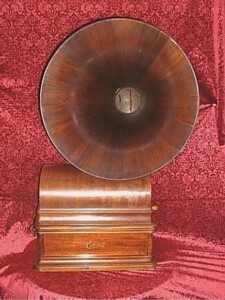 The Edison Opera in either oak or mahogany with wooden horn was the most expensive outside horn phonograph of its day, $90. The machine was unusual in that the mandrel moved underneath the reproducer. 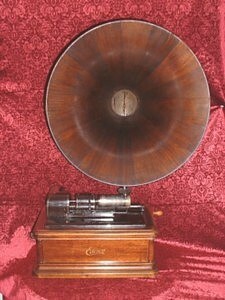 On all other cylinder machines the mandrel was stationary while the reproducer and/or tone arm moved.